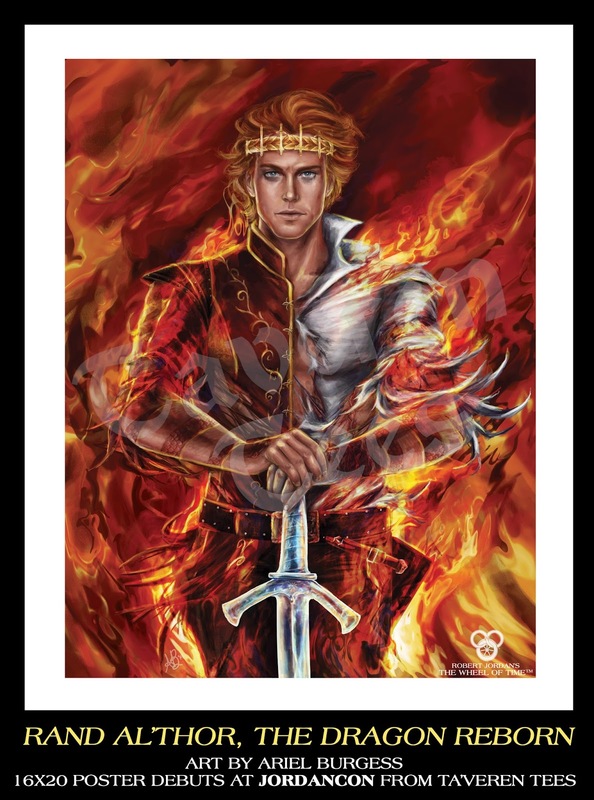 The new Rand al'Thor, the Dragon Reborn poster will be available for sale at the Ta'veren Tees booth in the JordanCon vendor's hall. 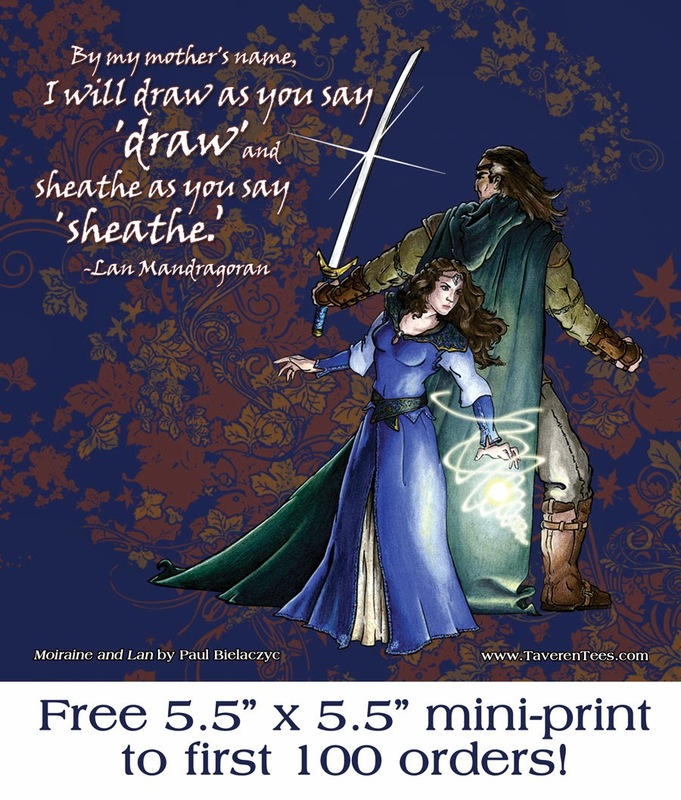 The poster is 16" x 20", including a 1" white border. It will retail for $20. The poster will be available for sale online sometime after JordanCon. Rand al'Thor, the Dragon Reborn was created by Ariel Burgess, the artist responsible for the calendar and playing cards. "The idea came when I was about to fall asleep," Ariel said. "That's when my best ideas happen. I finally got my mind blank when this image of Rand formed. It started close up to his face and panned out. The fire was moving along with the tears streaming down his face. I felt this crazy urge that I had to paint Rand like that. 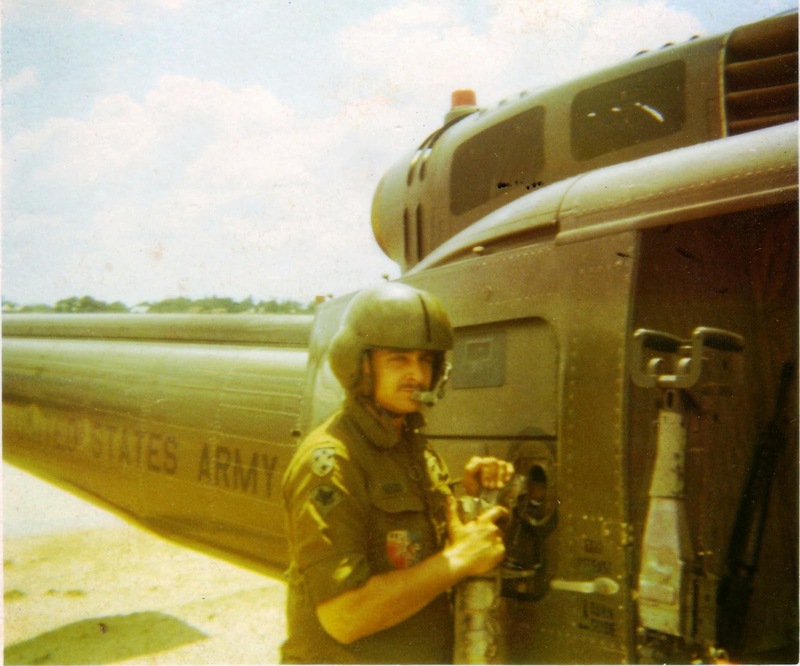 It needed to be shown and it would finally represent him the most [out of my work]." So Ariel painted, and we're glad she did. She began with a basic colored sketch, then moved to more realistic line art and flats. Then she began to make the sheepherder come alive by studying wounds and burns to add to his skin. "I really love Rand, so I needed to show who he is all around. I wanted to show how tragic Rand is with his wounds burning into him and his old self melding with the new one. The tear is to show how painful it all was, and the stoic face was to show that he pushed through and tried to be as hard as he could when really the soft side of him mattered just as much." Ariel has made many Rand al'Thor portraits over the years for various cards, posters, and personal projects. But this symbolic portrait of different sides and aspects of The Dragon Reborn is her favorite. "The image really means 'Rand' to me. All of who he is and what he went through to become Rand in the final book. I feel like as much as Rand is drawn by artists, it is rare to see who he really is and how tragic he is." If you're not registered for JordanCon, be sure to do so before April 1, otherwise you'll have to do so at the door. We hope to see you at JordanCon, and may the Light shine on you! That's right. 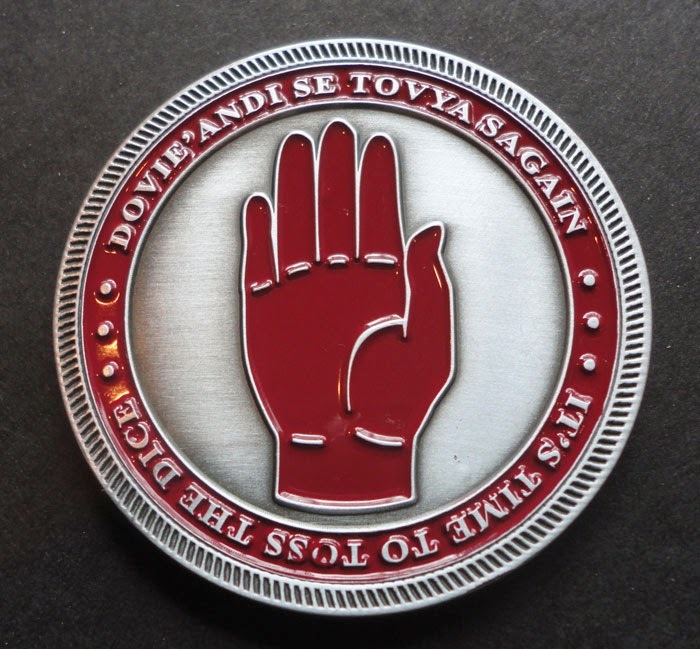 It's a Mat Cauthon Challenge Coin! Now THAT'S what we call a lucky charm! We'll release more information about this coin after JordanCon, so keep watching our page, blog and social media sites for updates! Ta'veren Tees was spun into the Pattern 3 years ago today! We thank the Light every day for all of our customers and for your continued support through the years! Can’t ignore the cold like an Aes Sedai? No problem. 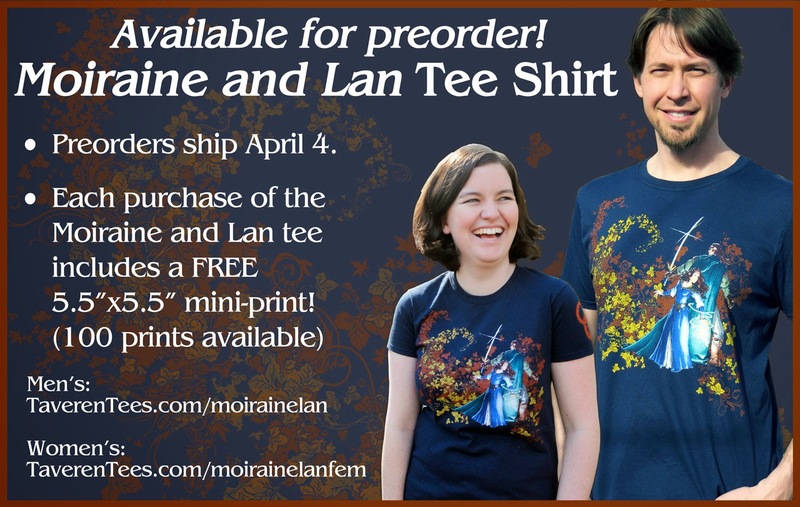 Ta’veren Tees has just added the first hoodie to their collection of The Wheel of Time merchandise, available for preorder now at www.TaverenTees.com/wothoodie. Preorders get $5 off the original price of the hoodie through Oct 15. Preorders will ship on Oct 15 and all products ordered in the same order will be held and shipped at the same time. The front of the hoodie features a distressed snake-wheel logo in gray on the left breast. 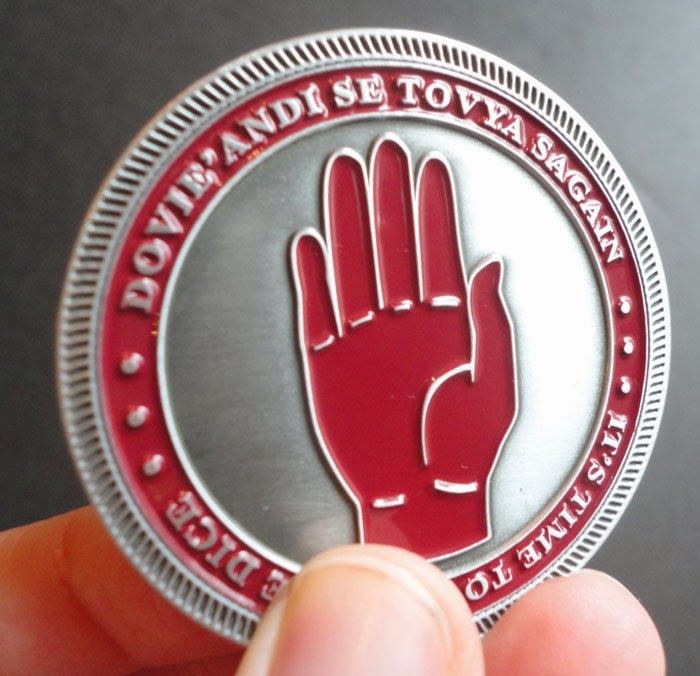 The back bears the iconic quote “There are neither beginnings nor endings to the turning of the Wheel of Time” – a reminder that though the series is complete, the story is never over. 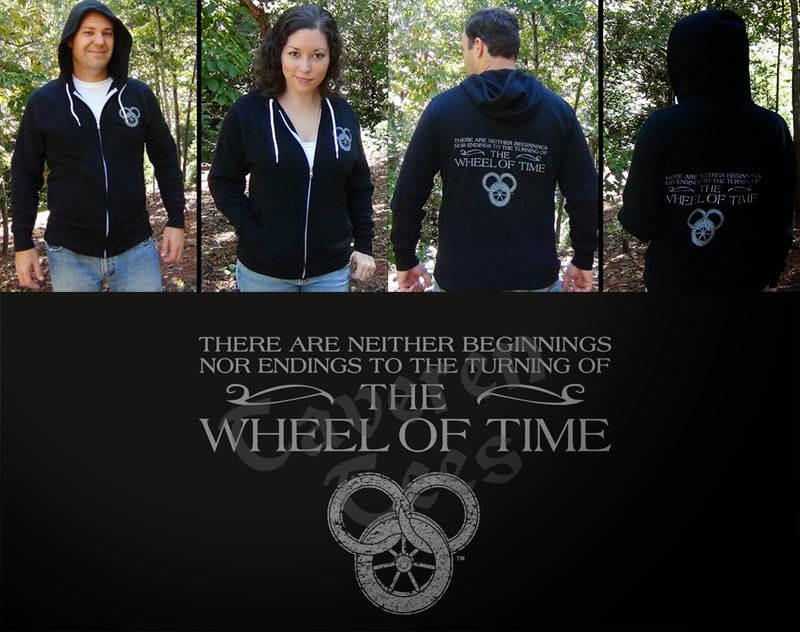 The Wheel of Time hoodie is a unisex zip hoodie on black with contrast drawstrings. S-3XL are printed on a 6.5 oz, pre-laundered 80% cotton 20% polyester fleece hooded sweatshirt made from premium, super soft, lightweight fleece offering a slim fit and quality construction. 4XL & 5XL are printed on an 8 oz, heavy-blend, preshrunk 50% cotton, 50% polyester zip hooded sweatshirt. The drawstrings on these hoodies are black. 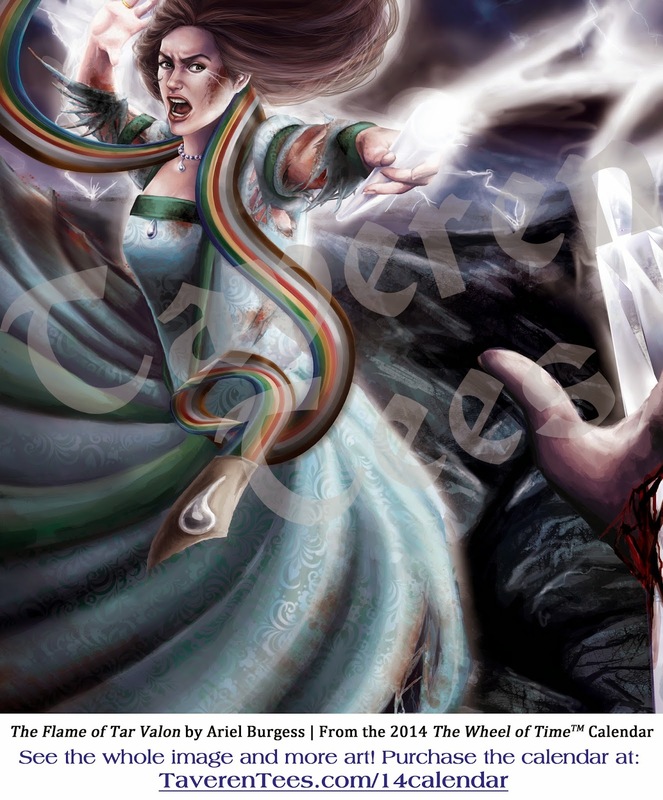 Ta’veren Tees is excited to announce the “Wheel of Time Playing Cards Decks” featuring the artwork of Ariel Burgess, are now available for pre-order at www.TaverenTees.com/novelties. 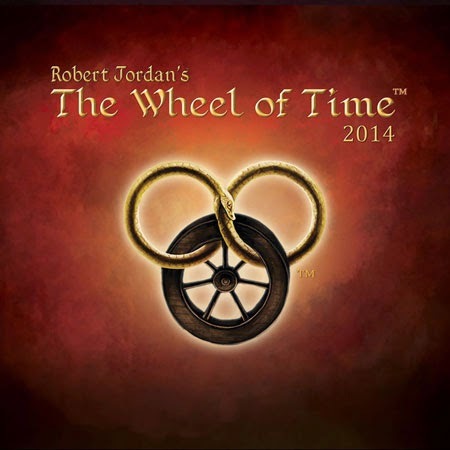 For The Wheel of Time®, Robert Jordan created thousands of unforgettable characters – both good and evil – that fans have come to know and love. 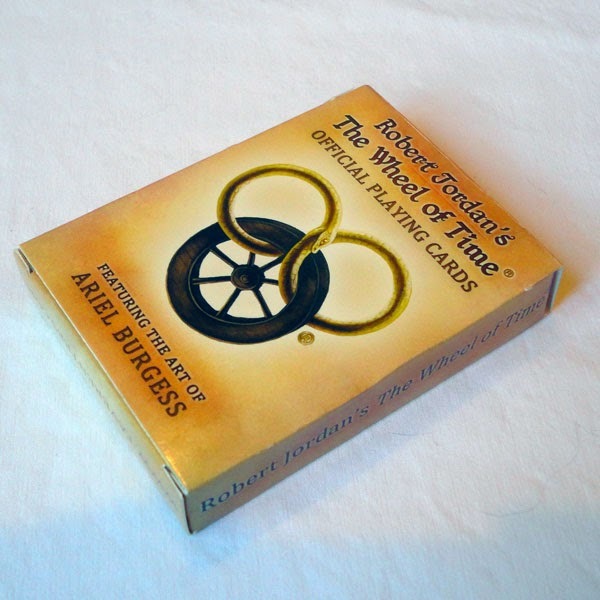 The Wheel of Time® Playing Cards bring over 60 characters to life through the breathtaking art of Ariel Burgess and are an essential addition to any WoT fan’s collection. Every card features a different character or characters from the series. 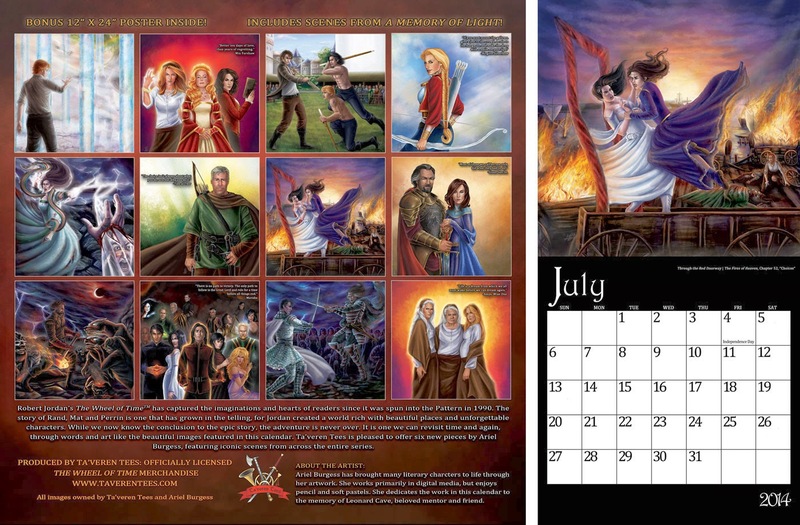 A portion of the proceeds from each edition sold will be donated to Mayo Clinic to fund research on Amyloidosis, the rare blood disease that claimed Robert Jordan’s life in 2007. Pre-orders begin shipping January 10th, 2013. 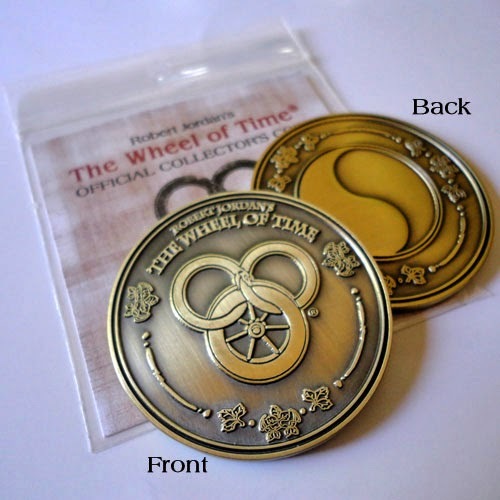 All items purchased in the same order as the “Wheel of Time Playing Card Decks” will be held and shipped at the same time. The “Standard Edition: The Wheel of Time® Playing Cards” contains 54 cards, including two jokers, in a single deck box. 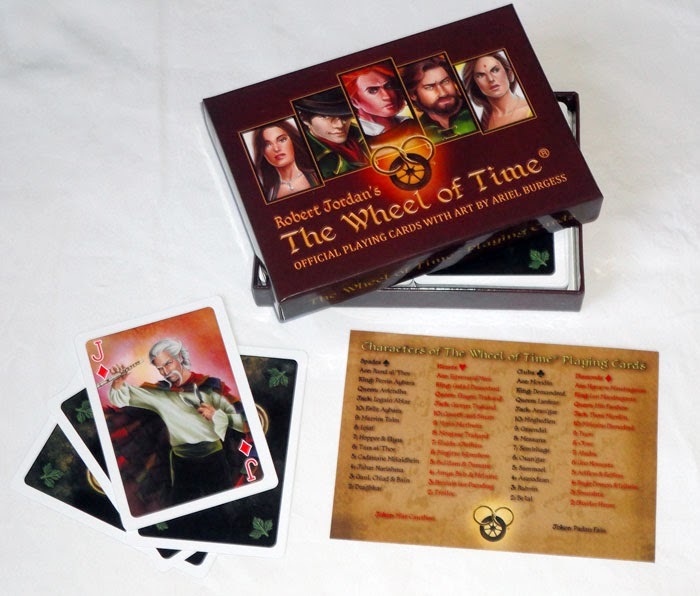 The “Collector's Edition: The Wheel of Time® Playing Cards” comes in a double deck box, with a character list and two individually wrapped 54-card decks, so you can play with one and display the other! The Collector’s Edition is limited to 500 units. "Tarmon Gai'don" by Ariel Burgess. Just in time for the Last Battle, Ta'veren Tees is excited to provide this stunning piece of new, NEVER-BEFORE-RELEASED artwork by Ariel Burgess titled “Tarmon Gai’don”. 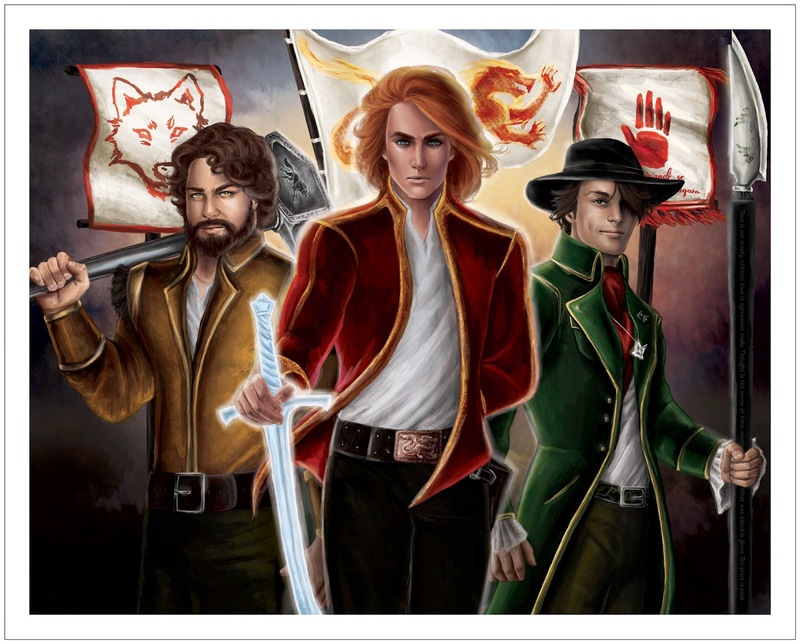 This 16" x 20" poster features Perrin, Rand and Mat as they are before A Memory of Light and the Last Battle. Add it to your art collection today! Ta’veren Tees is pleased to announce our new “Servant of All” shirt, now available for pre-order at www.TaverenTees.com/SoA. 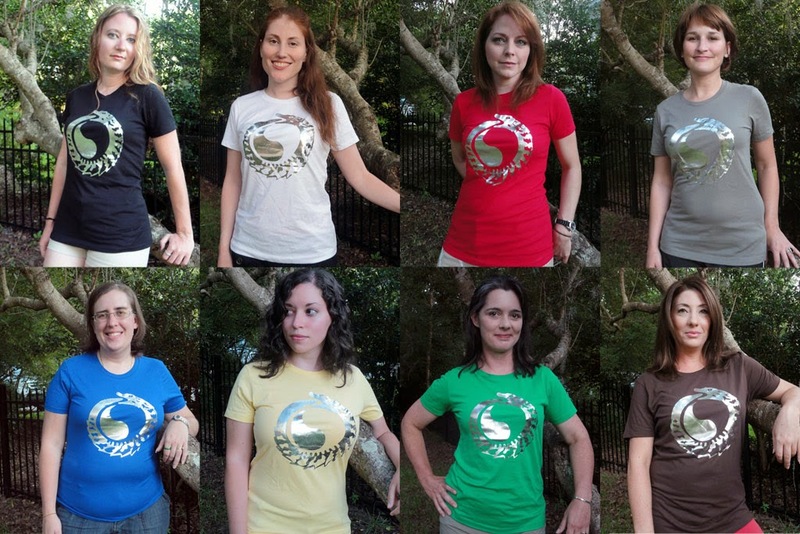 The ladies tee comes in all Ajah colors – including black* – and features the serpent and flame in metallic silver ink. This shirt is available in sizes S-3XL. Pre-orders begin shipping September 28. All shirts purchased in the same order as the “Servant of All” tee will be held and shipped at the same time. Ta’veren Tees is proud to partner with the newly founded Waygate Foundation. 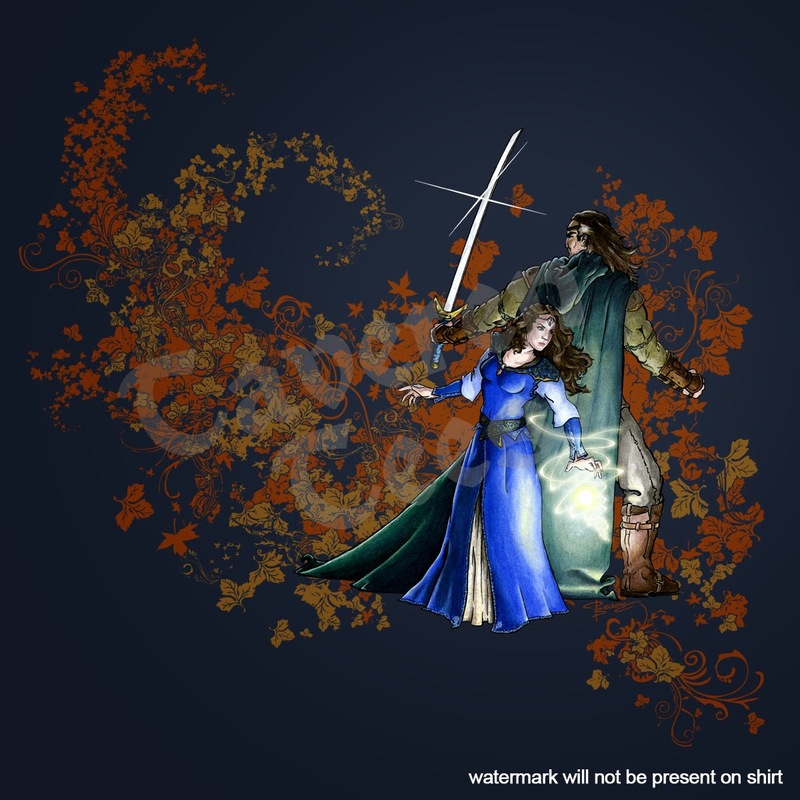 Now through September 28, 10% of pre-order sales of the “Servant of All” tees, as well as 10% of sales for “Asha’man” long-sleeve tees (www.TaverenTees.com/ashaman), will be donated to the Waygate Foundation. Waygate Foundation is a charitable organization dedicated to bringing together authors and fans of science fiction and fantasy in global charitable efforts. Waygate works with authors to run fundraising drives and events for charities of their choice. To learn more about them visit www.Facebook.com/WaygateFoundation. *Ta’veren Tees neither confirms nor denies the existence of a Black Ajah.